Growing new grass can be a finicky task. Sometimes, it takes forever to germinate. You might water too much, or birds might eat the seeds. 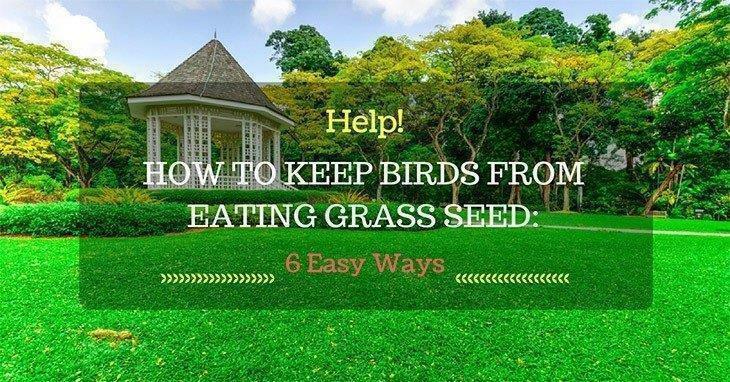 When all of your seeds are disappearing, you might wonder how to keep birds from eating grass seed. Birds can pick away at a sowed lawn in a short time. 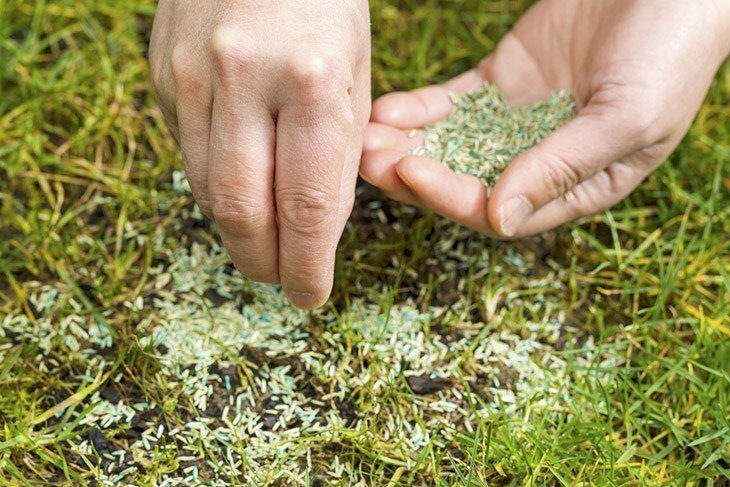 Before your lovely seeds fully sprout, birds will kill your new lawn. Unless you want to spend your entire summer trying to plant multiple batches of grass, there are a few tricks to keep the birds away. One of the most common methods to stopping birds is simply laying a thin layer of straw on top of the newly planted seeds. You want to it to cover about 75% of the seeds. You only keep the straw on top of the seeds until they germinate. At this point, you should gently remove the straw with a rake or by hand. Sprouts need sunlight to grow, so the straw must be removed. Try to rake the seeds into the ground well first before you use straw. You don’t want them in more than an inch or two, but this allow could discourage birds to leave the seeds alone. Another method for covering up grass seed is to use burlap sheets. Burlap allows water heat and sunlight to reach the soil beneath, encouraging germination. You might select burlap if you live in an area that receives a lot of wind. 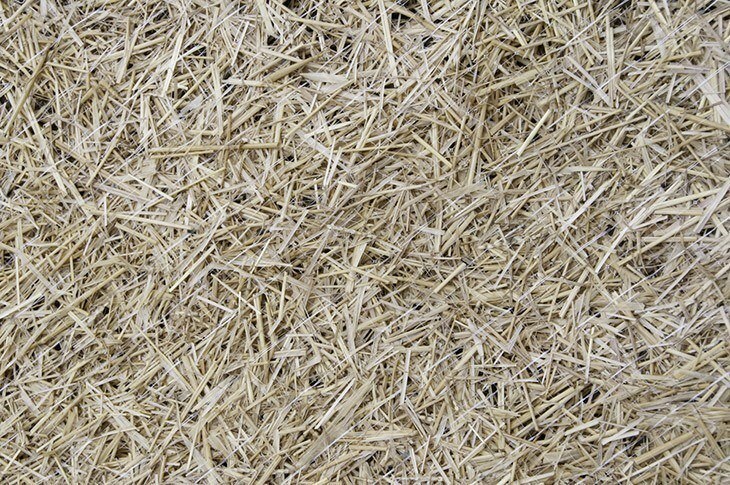 Straw tends to blow away easily, leaving the grass uncovered. If you want to use burlap, simply lay sheets over the top of the seeds gently. Then, use wire U pins to anchor down the burlap. After germination, remove the burlap. Some homeowners use metallic Mylar tape because it moves and flashes in the sunlight. As it moves, it also creates a noise that will deter birds. Together, the combination frightens all of the birds away.To use the Mylar tape, you need to put in a few tall posts around the area. Typically, they are three feet tall. You want to put the poles around six to seven feet apart. Tie the Mylar tape between each pole, but make sure you don’t tie it too tightly. You want the strands to move freely in the wind so it can flash and make noise. Birds are scared away easily. You probably know that if you have walked close enough to birds, they fly away in an instant. Take advantage of their personality. Whatever option you pick, it is important that you move the objects around at least a few times a week. Birds are intelligent, and they will soon realize they are decoys otherwise. Birds don’t like snakes, so some homeowners like to leave around rubber snakes. These are cheap; you can find them for $1 at dollar stores. Pinwheels aren’t just for decoration. They are effective measures for keeping away birds. The movement, noise and shiny surface tend to deter them from landing nearby. 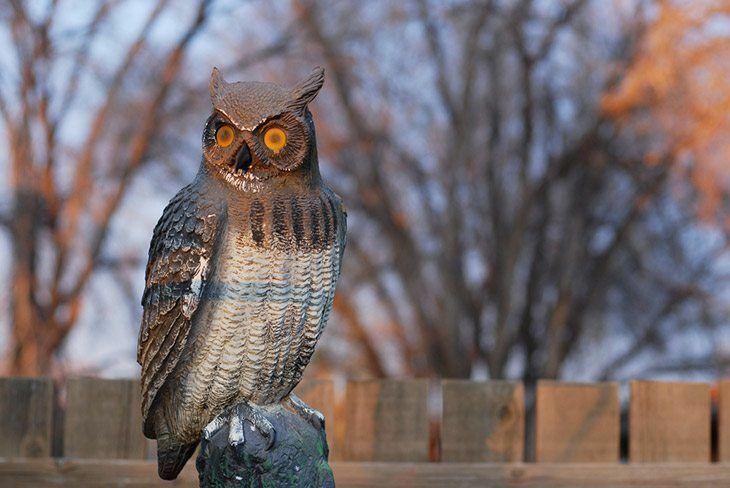 Plastic owls aren’t a normal, appealing decoration for your lawn, but they are effective at scare away birds. Shiny, helium balloons can be tied to posts or anchored with rocks. Birds can’t stand balloons! Aluminum tin pie pans can be tied to posts as well. These are effective because they shine and also make noises when blowing around by the wind. The sound of the pans smacking against a post will stop almost any bird. Old CDS also work just as well! You will need to tie them to sticks or posts. CDs don’t make as much noise as the aluminum pans, but they do shine and frighten away birds. Birds typically prefer quiet areas. This is why you will notice a flock in your backyard early in the morning before the kids plow outside. 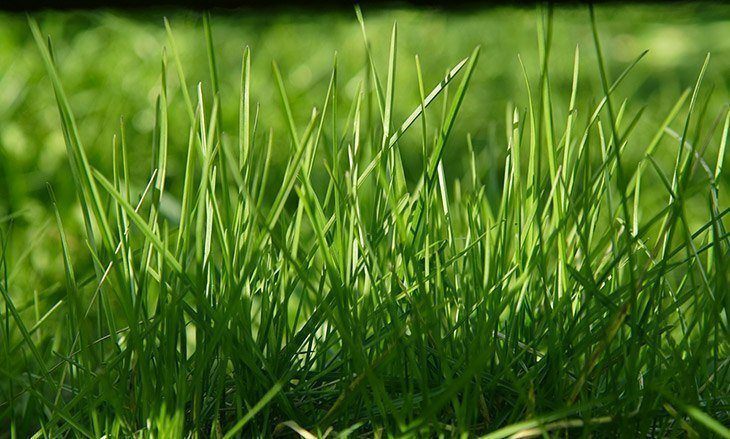 Once the kids are outsid Best Crabgrass Killer: Top Picks for Better Lawne making noise, birds tend to stay away. Take advantage of this and use noise devices to deter birds as often as possible. There are wooden ducks you can purchase that move their wings with the wind. Some of the ducks also can make sounds. 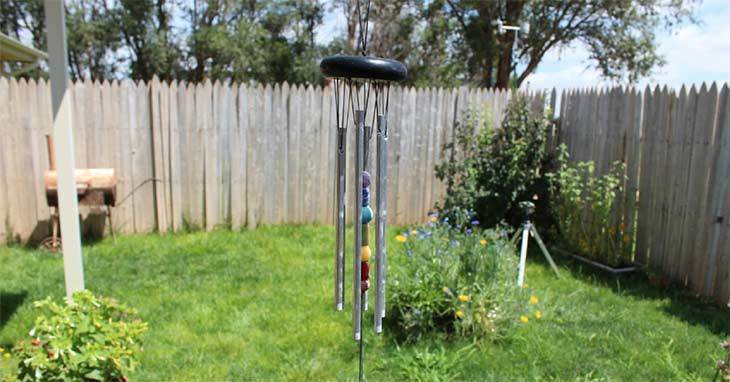 Wind chimes are a lovely addition to any home patio. Besides making beautiful sounds with the wind, birds don’t like them. You can hang a few around the area where you planted grass seed. Above, aluminum pans were mentioned. You could also use the same method with tin cans tied with strings to posts. They will bang around with the wind. Sometimes, the birds are persistent, and you might get frustrated with constantly trying to deter them. If worse comes the worse, one of the best methods of keeping birds from eating grass seeds is to give them something else to do. Hang up a few bird feeders on the opposite side of your lawn. Birds are attracted to bird feeders. They also love bird baths! Remember that birds go through bird seed fast. 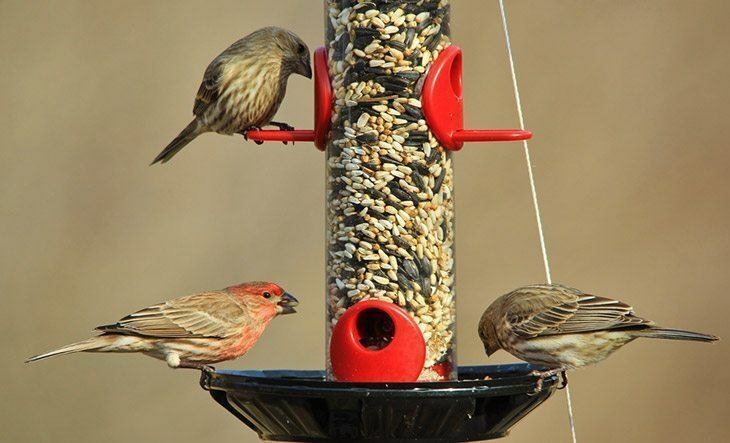 You will want to fill up the bird feeders daily to keep them away from your grass seed. As soon as the food is gone, they will go back to the grass seed. Birds naturally love grass seed. There is little you can do to stop the love affair. Once you lay down grass seed, it is you against the whole population of birds. The best method is to try to lay something over the top to stop them from eating the grass seed before germination. ​Once germination occurs, your sprouts are still delicate. 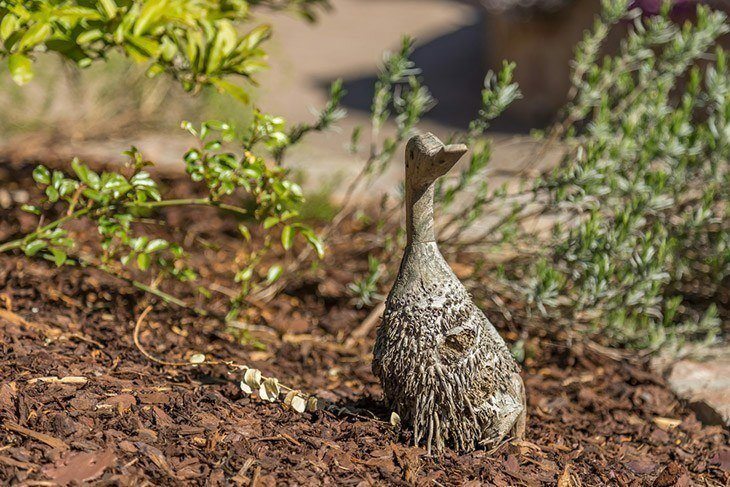 Try using decoy methods, such as rubber snakes and tin cans, to stop the birds from visiting your lawn. Learning how to keep birds from eating grass seed is truly just a trial and error process to see what works best for the birds in your area! Let us know what you think by leaving a comment below. Share it with your friends, too!